Mr. Kader suggested late August or September as optimal times to hold the symposium. 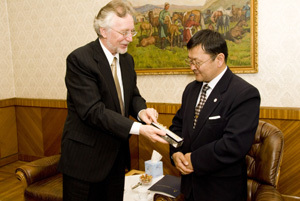 He also said he personally supported the idea of holding a symposium in Mongolia. 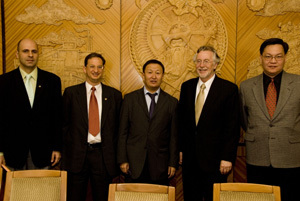 "Since Mongolia has a long history of religious freedom going back more than 800 years, it is appropriate to hold such a meeting here", he said. Mr. Tsedendamba said, "I am happy to meet people who represent the right of all people. Most of the time I meet people who represent the rights of just one group." He too gave his personal support to this symposium. "The world is becoming more complex. In times past in one community, one religion was represented. Today in one community many religions are present." Dr. Graz reminded those present. Mr. Tsdendamba said, "Yes, this is a new phenomenon that members of the same ethnic group will have different religions within their group." In talking about the need for religious freedom for all people Dr. Graz lamented that, "in the past one religion was against another religion. Today we find people of the same religion fighting each other." After the fall of communism "a desire for religion, that had been hidden for many years, was discovered in many people," said Mr. Tsdendamba. "I welcome you to work with us to hold this symposium to further religious freedom for all people".